Have you finally had enough of your ill-fitting and old dentures? If so, please let City Dental Practice help you today. For some people, having outdated or uncomfortable dentures has really affected their confidence and lifestyle. However, with so many comfortable and modern alternatives available to us now, City Dental Practice is not only able to restore your smile with a comfortable and snug denture, but restore your confidence and happiness too. There are several types of dentures that are described as either full or partial dentures. Full dentures are used to replace all of your teeth whereas partial dentures are used if you only need to replace a few missing teeth instead. Flexible dentures provide patients with a more comfortable fitting partial denture because the flexible resin based material can adapt more closely to the unique shape of your mouth. This acts as a great advantage in securely stabilizing your denture especially if your mouth has had a lot of bone and gum shrinkage. 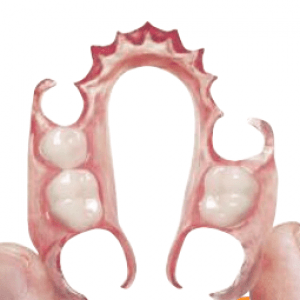 The flexible denture can also mould around teeth so that there is no need for metal clasps. 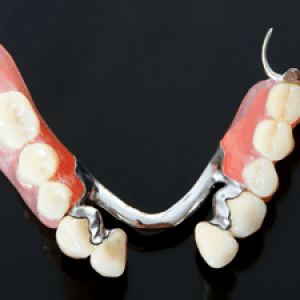 Chrome dentures have a durable metal base plate or framework that sits on and around the natural teeth, acrylic is then used to attach the denture teeth to this base. The material used for this plate is cobalt chrome, a strong and lightweight alloy. Chrome partial dentures are less bulky than standard plastic dentures and are more hygienic as they cover less of your mouths soft tissues. What are high impact acrylic dentures? High impact acrylic is one of the most durable materials that can be used when creating your denture framework. If you often find yourself dropping your dentures in the sink and running the risk of them breaking then high impact acrylic could be the solution for you. Another major benefit of having your denture framework made from this acrylic is that the colour can be adapted to match the colour and texture of your gums; this presents a more natural look. If you have finally decided to invest in a new denture to improve your life, please visit City Dental Practice to ensure you’re provided with the most effective and comfortable solution. Dr Amit Kohli is really passionate about providing his patients with comfortable restorative solutions such as flexible dentures. He guarantees that your new dentures will dramatically improve your confidence and has years of experience helping people who are in a similar situation to you. For more information about dentures or to book a complimentary consultation with Amit, please call our friendly reception team at City Dental Practice on 0121 455 9233.